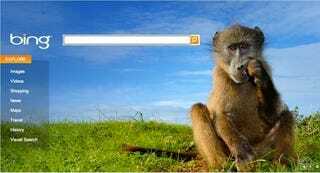 Sometime around 9:30 last night, Bing disappeared off the internet for a half an hour, give or take. Our question for you: Did you notice? 2. Bing users don't bother complaining; they just use Google for a half an hour. They're natural switchers anyway—they switched to Bing, right?—so it's not a big deal to shake things up for a bit. Google users, they're stubborn. 4. Shut up you jerk, I was utterly beside myself between the minutes of 9:24 and 10:07 PM EST last night, because of the lack of Bing. Now you go! What will it take before Bing starts to feel, as depressingly as Google, like some kind of digital phantom limb? Will it ever?